A report just released by the Center for Disease Control reveals that city which performed the largest number of abortions in minorities was New York City. The CDC Abortion Surveillance Report dated November 28, 2014 reveals that in 2011 almost 56% of all abortions reported for race were done on minority women. That is a slight decrease from 56.7% in 2010. The total number of abortions reported in 2011 was 730,322. 405,994 abortions were reported in states which recorded the race or ethnicity of the women. Of the 405,994 abortions for race or ethnicity, 150,942 (37.2%) were performed on White women, 146,856 or (36.2%) were reported on Black women. Hispanic women accounted for 79,408 or (19.7%) while 28,363 or (7.0%) of abortions were categorized as other. The highest number of abortions reported on minority women were recorded in New York City. 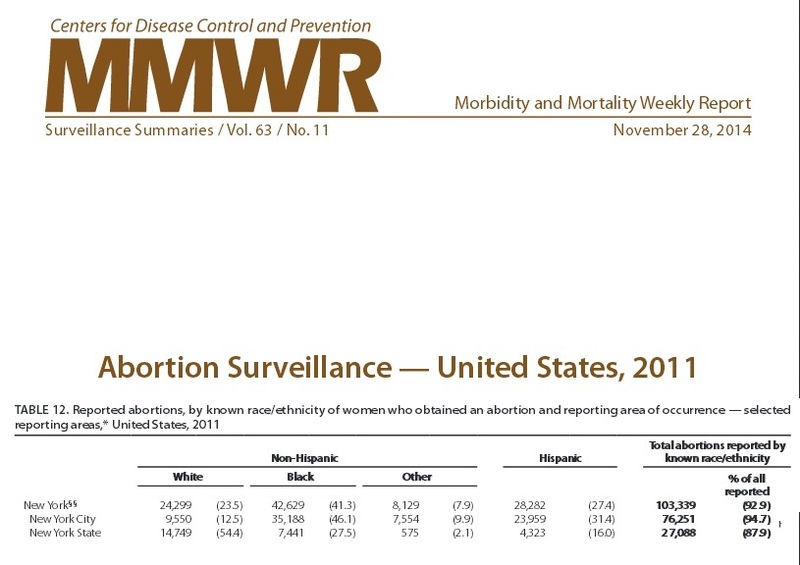 36.2% of the total number of abortions recorded for race or ethnicity were reported on Black women. Mississippi which currently has only one abortion clinic in the state had the highest number of abortions reported on Black women coming in at 63.4%. Alabama, reported that 58.7% of their abortions were on Blacks while in Georgia they reported 52.1% abortions on Black. Tennessee performed 49.9% of their abortions on Black women and Virginia performed 43.9% on Black women, while Michigan’s Black abortion percentage was 47.9%. 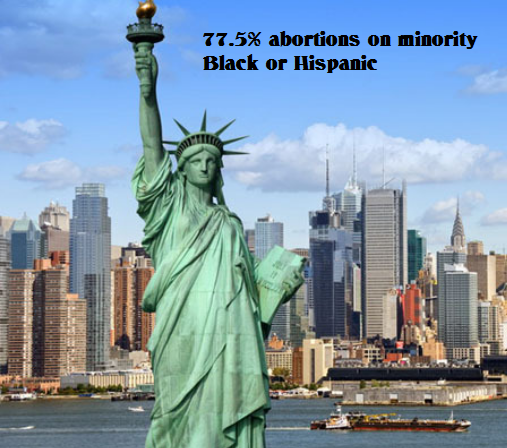 New York City alone performed 46.1% of their abortions on Black women and 41.1% of Black abortions was reported in Missouri. Pro-lifers have documented that abortion targets the Black race. This is not a surprise given the fact that abortion was founded in eugenics. 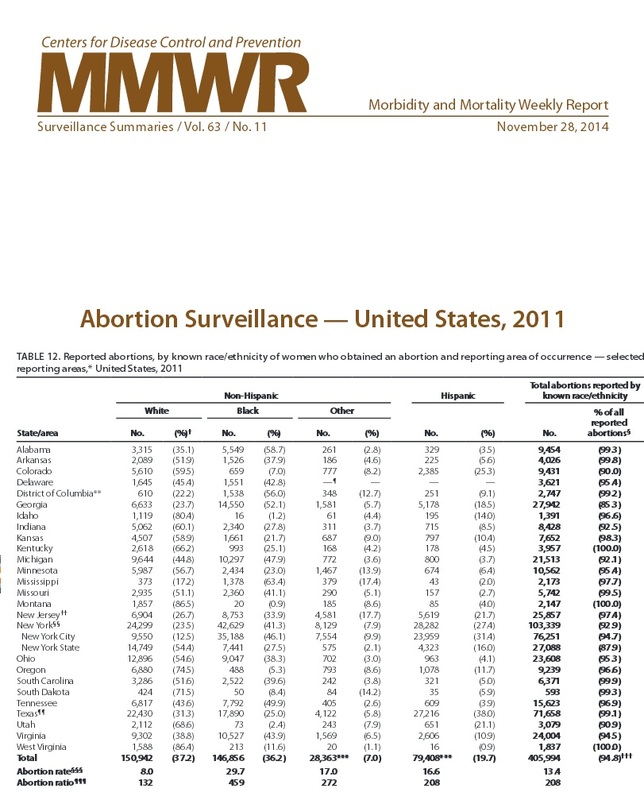 The media continues to hide the fact that the number one killer of African Americans in the Unites States is abortion. This entry was posted on November 29, 2014 at 9:44 am and is filed under Abortion Numbers, Black Abortion Stats, Hispanic Abortion Stats with tags 2011, 2014, Abortion, abortion numbers, Abortion Survelliance, Black, Black Genocide, CDC, Eugenics, Hispanic, minority, Racism. You can follow any responses to this entry through the RSS 2.0 feed. You can leave a response, or trackback from your own site. 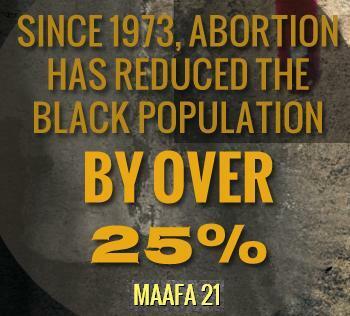 We need to end the problems that lead to abortion in the black community. When we do this these numbers will drop. I’ll never forget what a “conservative” activist told me when I first became active in the pro-life movement. He told me he didn’t want abortion to become outlawed because it kept down the black population. Needless to say, I shook the dust from my feet to that man and everyone else who has such a wicked mentality.